It has been years since we last celebrated DinoBoy's birthday with family and friends, partly due to financial situation, partly because I was stretched out by work and family commitment plus coaching DinoBoy on his school work (yes, I just have to mention that because I truly hate his mountain of school work), leaving me little energy to do anything else. This year as the school preps the students for PSLE next year, it seems that he haven't had enough time to rest or take a breather as the teachers are piling the students with loads of work, there were always some homework from one of the subjects daily. We played a lot more lesser which I wasn't happy about it so I decided that on his birthday he should have a day of maximum fun with his cousins and friends! 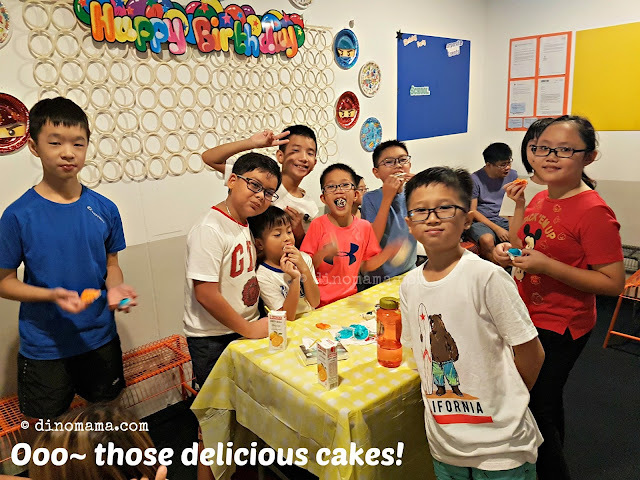 I was asking among friends about the birthday parties they hosted for their kids, most of them mentioned indoor playground or a simple buffet at home for family & friends which wasn't quite what I was looking for this time. Then Mummy Edlyn mentioned that she hosted Ethan's birthday party at Tag Team Singapore not long ago. I went to their website, liked what I saw and contacted them immediately through their website to inquire about available slots at their Downtown East venue. Talking about efficiency, I was surprised to received a whatsapp message from them the next day! That's not all, throughout the following month up till the day before our party, they were responsive to my queries in whatsapp too. I even received a reminder email on my "date" with them 2 days before the party. Frankly speaking, I was a little worried after I made payment to them because I have never seen this place before and know nothing much except from the website and what was shared with me by Mummy Edlyn. I was so afraid that they have "forgotten" my booking n mess it up. I initially planned to do a site visit but I did not managed to find time to do it, the reminder email finally sets my mind to ease. And just like that, it was all done. We made booking for their 2 hour Multi Equipment Laser Tag package @ SGD450 (peak hours) that includes an hour of 4 missions play time and 1 hour for usage of their party room for food and beverages. Remember earlier I mentioned that I have never been to Tag Team Down? On the actual day we went there 30mins earlier than our slot @ 11am thinking that we could settle in while waiting for the guests to arrive BUT they are not open yet, apparently their operating hours starts at 11am *opps! * They were very kind to let us in while they are busy setting things up to start their day. We did a little exploration while trying not to get in their ways as they check the guns etc to ensure that they are in working conditions. I was expecting a huge room or even a few rooms but instead there was only 1 big area with foamed obstacles. The photo below shows the right side of the room, you can see the left side and the entire area in the video. Not a huge space but I think for the kids it is good enough for them to run around. There is a party room big enough to fit in about 15 adults comfortably, with a 3 seater sofa and some metal benches around the room. A cozy little place for game break and food later. The best part about this place is that it's fully air conditioned! When every one's arrived it is time to start the party! Oh wait! Before all the kids all dashed into the room they had to sit quietly and listen to the facilitator for a 10-15mins of Mission Briefing where the facilitator introduced to all the equipment or laser guns that the kids will be using during the 1 hour laser tag game. The following Safety instructions were also given out. No Running - quite impossible but I guess if its not mindless dashing it is ok.
No Moving of Obstacles - eh no picking up the foam blocks and throwing at the opponents okay! 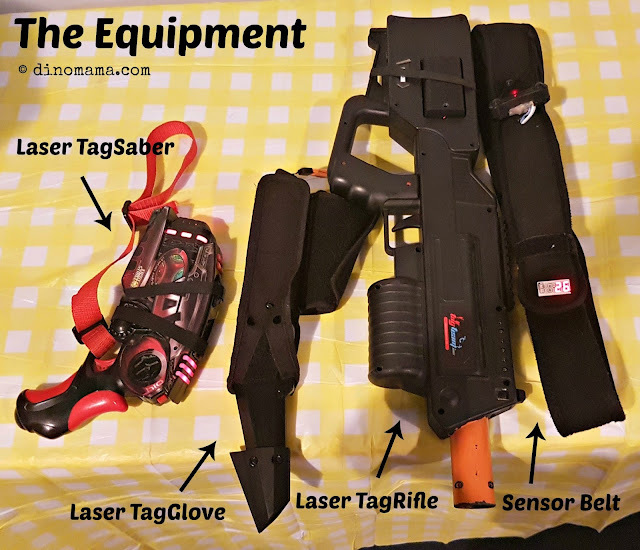 In case you are wondering, the laser gun uses the infra red technology much those you seen in your remote controls, so you aim and "shoot" at the sensor on the Sensor Belt to "kill", and the belt will vibrate when you are "hit". As the birthday boy DinoBoy was given the privilege to choose his team mates and he picked those sitting next or close to him hahaha~ clever boy! No need to ponder or think who to choose. So the kids get into their respective team; Blue Team and Red Team, together with the 2 facilitators who is in charge of each team, they entered the room eagerly and the 1st game started. 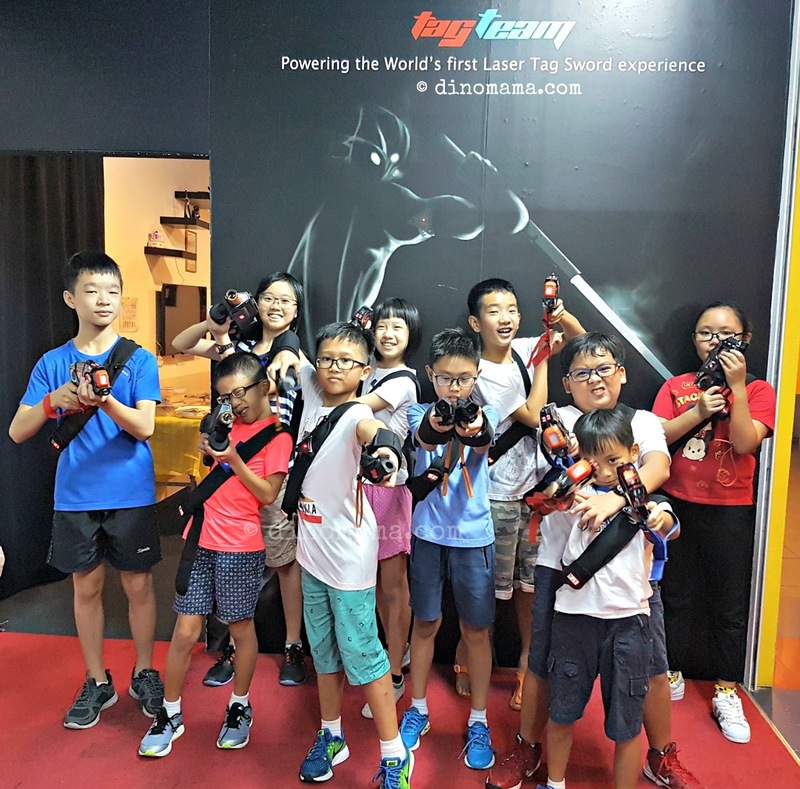 Even though there are only 2 facilitators, they were able to control the kids, even managed to break up a little squabble among the kids in short time. Of course, the kids were well behaved too, they know to give and take so that every one can have fun together. Good job kids! I am so proud of all of you! Having said that, it was still chaos and "war like" in the room with the kids screaming, squealing, shouting, laughing at the top of their voice. 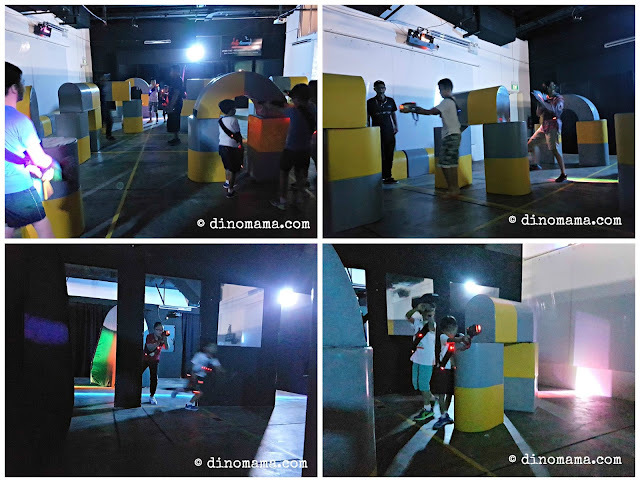 It was challenging to take photo, besides being too dark for clear images, every time I aim my camera at them, the next second they ran off and the frame only captures blur images or the foam structures. So videos are better to capture the fun they had at that time. I am sure the adults standing at the side watching them are enjoying themselves too. Judging from the kid's expressions in this photo I am sure they had enormous fun that day! It was further validated when DinoBoy told me that they were talking about it on the following school day. 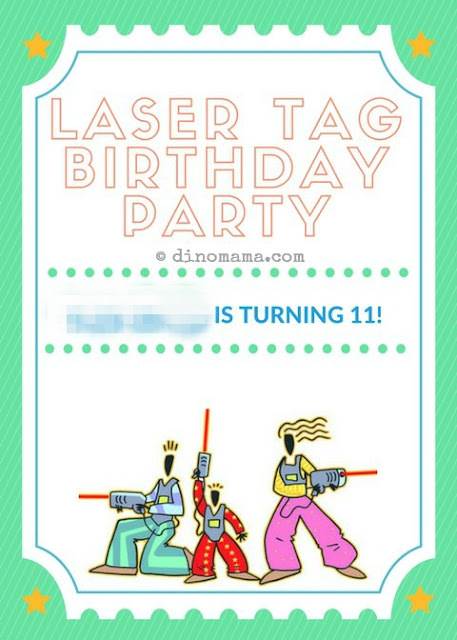 I am so glad that I made the decision to go ahead with this party at the last minute, now DinoBoy will have a great memory of his 11th Birthday. 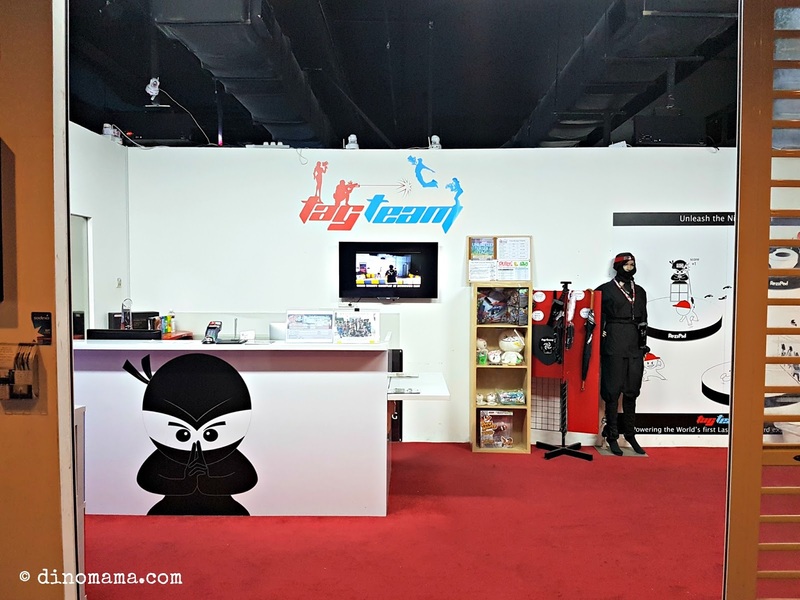 Note : Tag Team Downtown East is tucked away in a corner on level 4 of E!Hub Pasir Ris. You have to walk towards the Cathay cinema ticketing counter, turn left and walk further in to reach the place. 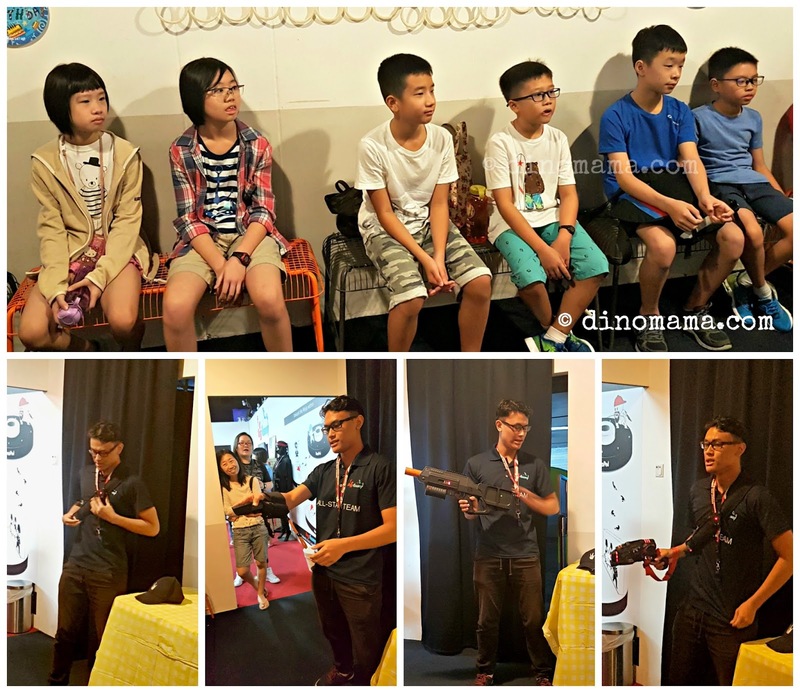 Besides the Multi Equipment Laser Tag, Tag Team Singapore has other activities too. 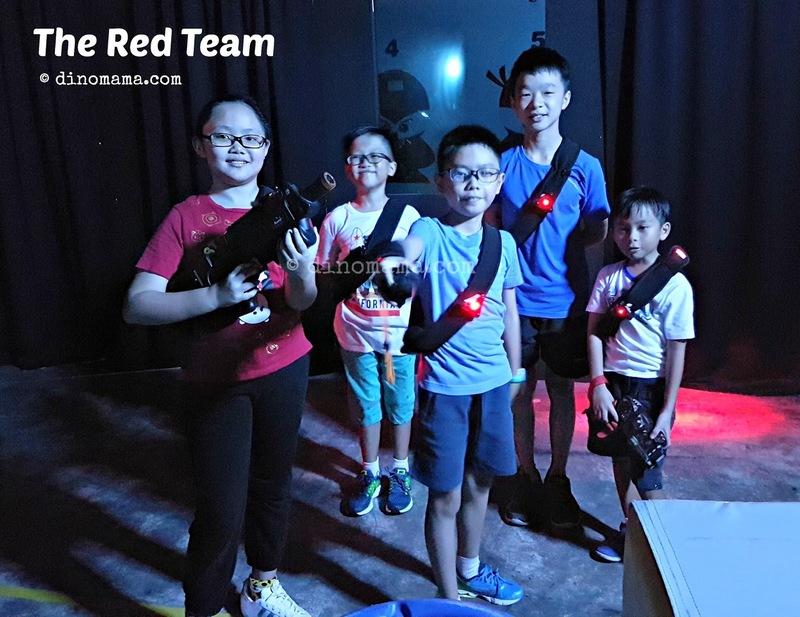 For the older kids perhaps they can try the Virtual and Mixed Reality Laser Tag. 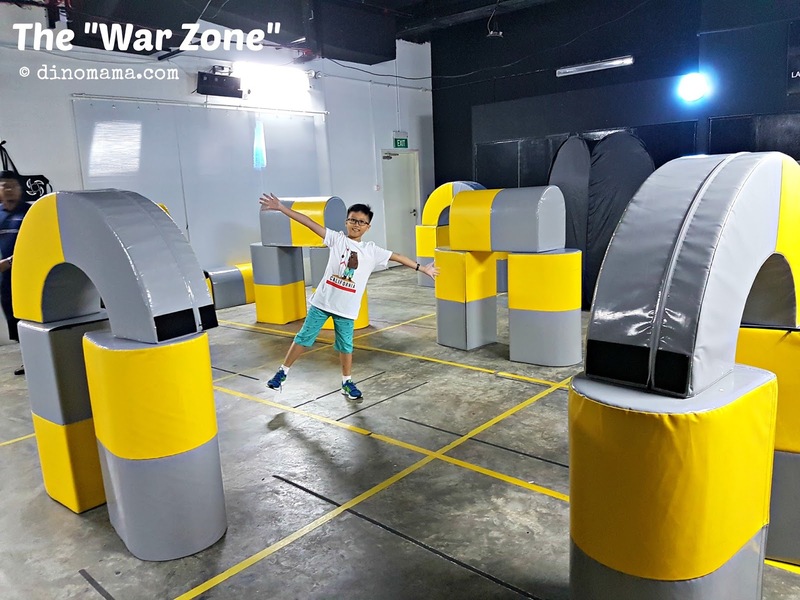 They also do customized events for both indoor and outdoor venue all over Singapore. 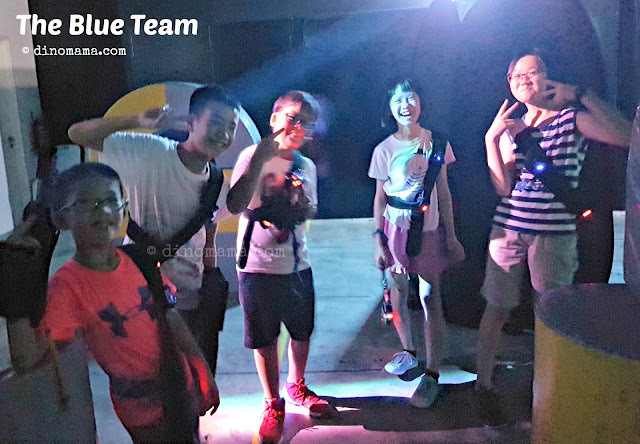 Do check them out if you are planning for a group fun for your kids or your friends/colleagues. With the venue booked, I proceed with the guest list with DinoBoy and since I do not have any of the mum's contact number, I had to write a simple note about the birthday party for the kids to bring home to their parents. I thought I have to chase the parents but wow~ they are such wonderful parents who replied me days before the RSVP date. Days later, I sent out the birthday invitation card via whatsapp (don't you just love such instant messaging platform!) to all of them. The card looks decent eh? I created it using Canva, an amazing online design software. They have a lot of templates to use or if you are feeling creative you can make one from scratch with their many choices on layout, text etc. I was so happy that I managed to settle the party venue & guests list from the comfort of my home and workplace that I almost forgot to order food! And that was like less than a week to the party! Well! Here's another efficient company that saved my day! We have been ordering buffet from Neo Garden Catering during DinoBoy's past birthdays, they had never disappoint us with their food so this time I decided to go back to them again. Their Mini Buffet attracted me because it starts from a minimum 15 pax with as low as SGD6.50 per pax and also because Mummy Edlyn ordered that and she was satisfied with the food (see, word of mouth is very important!) I decided to opt for that choice. 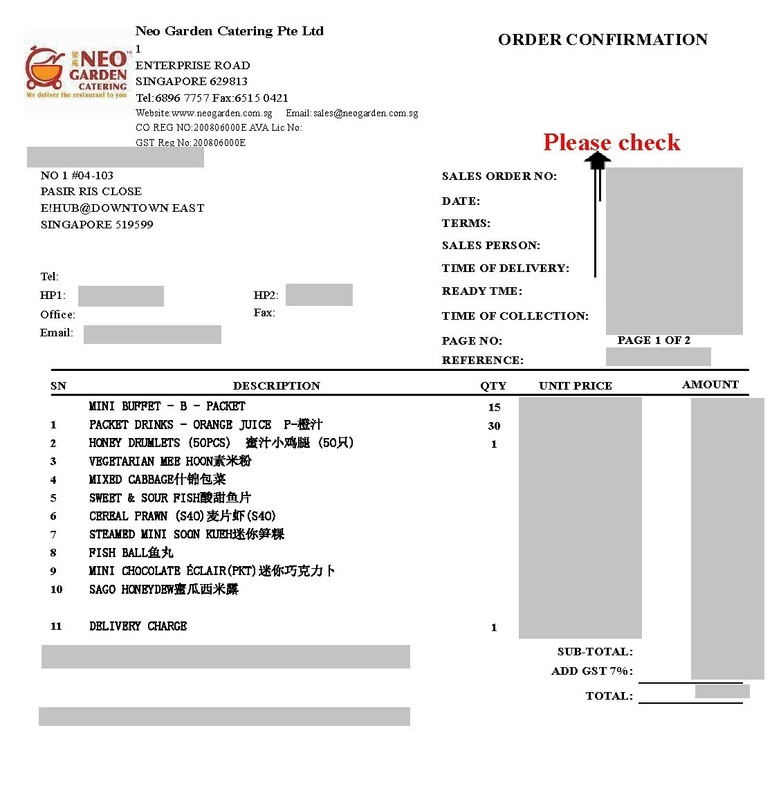 A day after I placed my order online, I received a call from their sales coordinator to confirm the food ordered and payment arrangement. It was again a good experience with Neo Garden Catering. How so? Well, you know how frustrating and time consuming it is to have to speak to different people regarding our order and repeating the same thing again and again. With Neo Garden Catering, it was a breeze for me as the same Sales Coordinator handles my order and that makes communication easier and faster too. Since it's a kids party, I like to make sure the food I ordered are kids friendly, that means not too spicy. The Sales Coordinator was patient enough to answer my queries and even ensure me that the food is enough for all to enjoy. When I needed to increase the number of pax 2 days prior to the party there were no issue at all too, it was confirmed immediately over the phone and confirmation emailed to me. And I receive SMS when my order is confirmed, credit card payment made and even their delivery man's name and mobile number on that day too! Do note that the mini buffet does not comes with food warmers, instead they are delivered in a huge food warmer bag. They are packed nicely in durable decent looking take away containers where you can simply remove the cover and serve the food in a presentable way. The vegetarian bee hoon we ordered were packed in sturdy tupperware with side locks. You must be wondering why there weren't any photo of our food. Well, this Mama was so busy setting up the food and getting the kids to eat that she totally forgotten about it. Nonetheless, the food received Thumbs Up! from the adults that were there and tasted the food. Well done again Neo Garden! Note : Actually there is no need to order exact number of pax for the kids because they are so hyped up with the running and shooting that they weren't in the mood to eat. Though they drank loads of water because they perspired so much! Playing is such hard work! I first got to know about Little Sweet Tooth Bakes when we attended Dumpling's birthday a couple of years ago, her How to Train Your Dragon cakes were something new at that time, most important they were super tasty too! 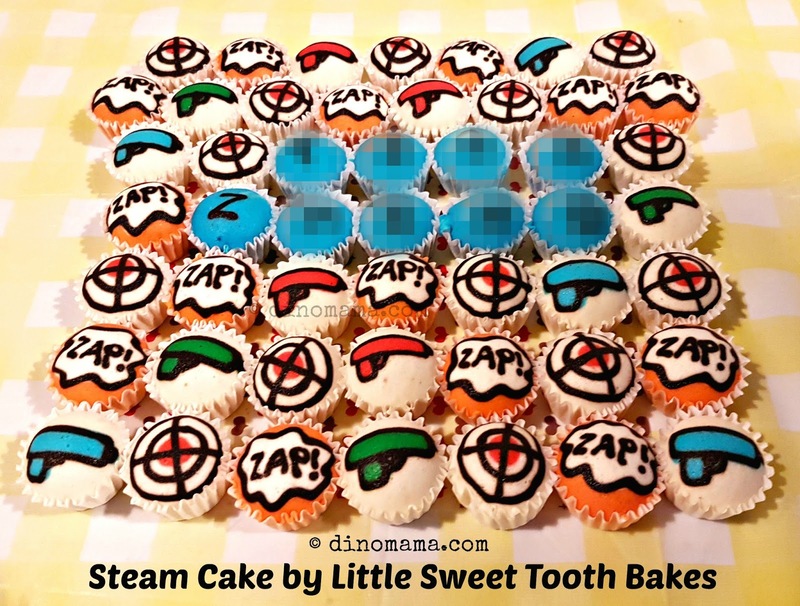 As they made customized orders, I discussed with DinoBoy and he wanted laser guns, target and the word "Zap!" design on his cake. I have no idea how the cake will turn out since they do not do sample for me to see but I have total confident in them after seeing their work online and on Dumpling's birthdays. 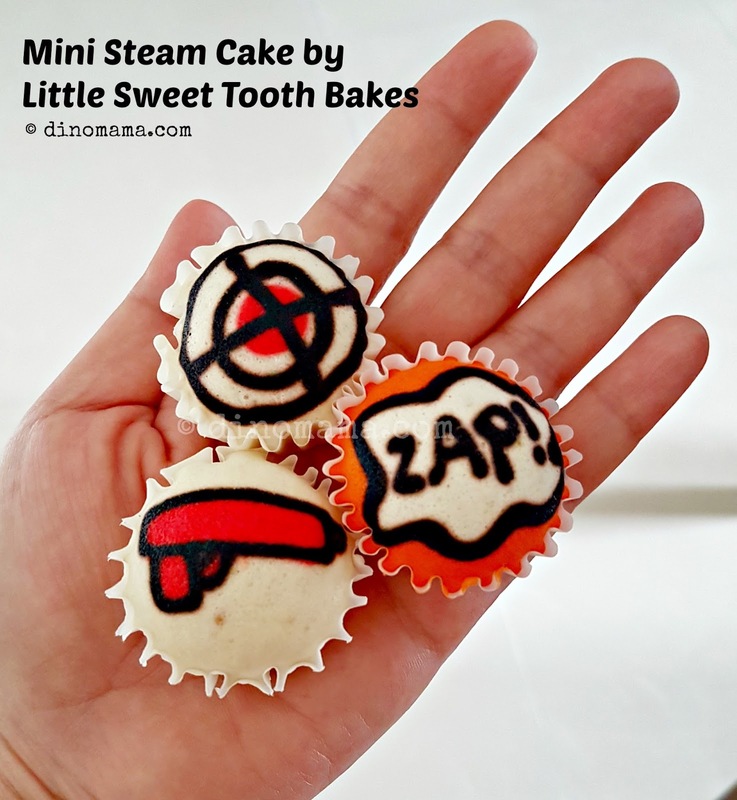 They really did not disappoint me, look at the cute color fun steam cakes! We opted for Speculoos Crunchy fillings, the crunch gave texture to the soft steam cake, added on with their mini size you really cannot stop yourself from popping them into your mouth non stop! Lucky I ordered 50pcs so there were plenty to go around. Look at the kids stuffing those delicious cakes into their mouth. You don't see DinoBoy look so decent, he had 1 cake in each hand that he is hiding behind his back. Usually Little Sweet Tooth Bakes will take order for bigger size steam cake for candle blowing but the lady boss was away and only back a day before my party so there wasn't enough time to make the bigger piece. No big issue at all, I simply pop by Spotlight to grab the "Happy Birthday" alphabet candles to stick onto the mini cake. 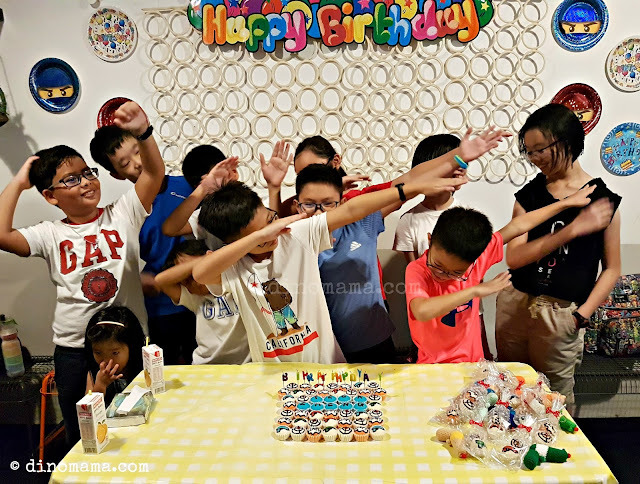 And how can a party end without the famous Dab pose? Don't know what this is? Where did you go these few years LOL (actually I also don't know what it is till earlier this year hahaha~), read about it over here. You know how organising a party can really get into your head and you start thinking to add MORE things to it? Well, that's what happened to me, 5 days before the party I thought to myself "Why don't I do a small gift for the kids as a keepsake and remember DinoBoy's fun party whenever they see that gift?" So I sat down at my work table and made a stuffed toy Laser Gun, add in the keychain and viola! Simple to do but to make TEN of it in 5 days where I only have like 2-3 hours per night to do, I was really challenging myself to the max. Regardless, since I started it I have to finish it by hook or by crook. 5 days with 2 sleepless night later 10 beautiful Laser Gun keychains are done! 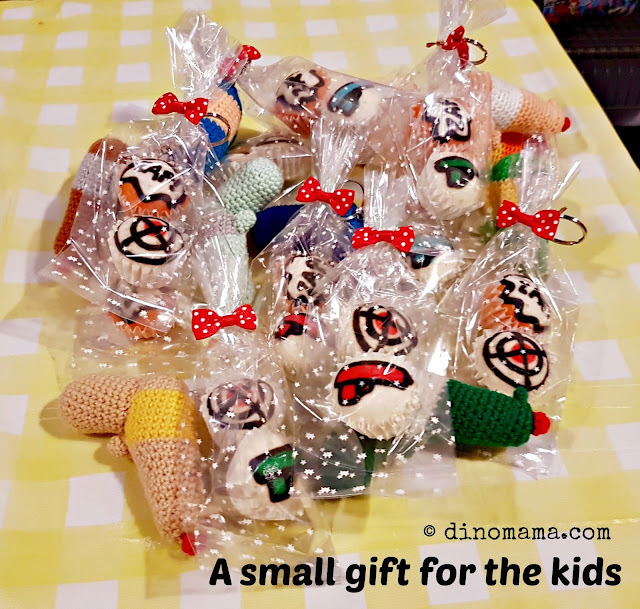 I attached them to the cute little mini packs of steam cake to be given to the kids at the end of the party. 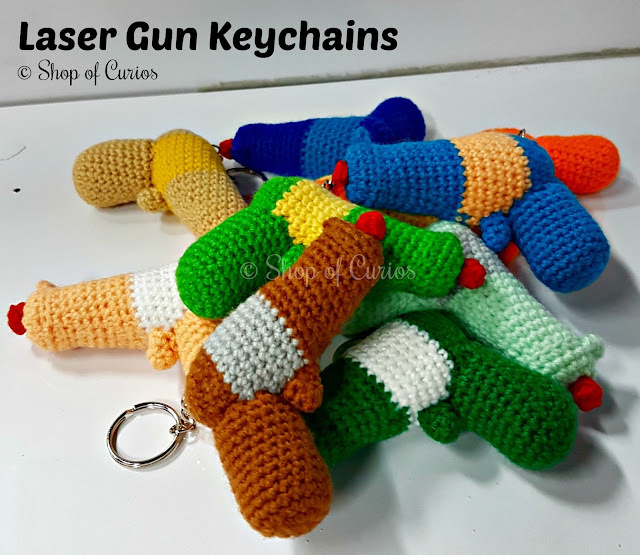 If you are interested to order these laser guns for your party send a message at my shop Shop of Curios. I do customized orders of keychains, soft toys, bags, pouches etc too. 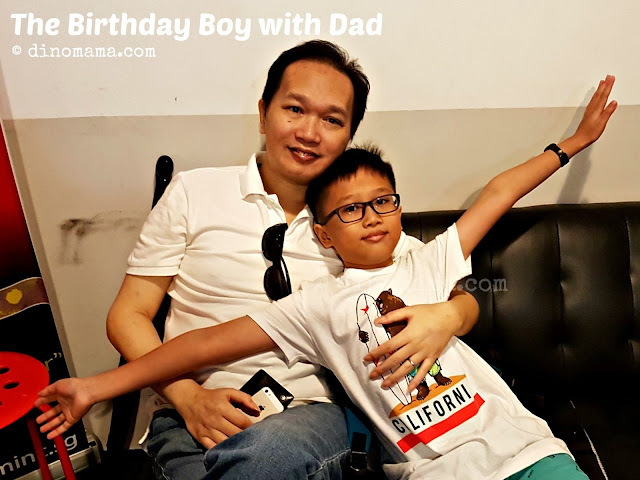 Having planned the boy's birthdays when he was younger where preparation have to start months before with the start of sourcing stuffs to put in the goodie bags to the ordering food and cake nearer the party day, it was a hassle and a big "investment" especially I have to host birthday celebration at home with the family and in school. This time it was so much easier and simpler, not to mention pocket friendlier too! I guess as the children gets older, birthdays are more ABOUT them and FOR them, it does not need to be elaborate, all they need is a place and time where they can have some fun time with friends. 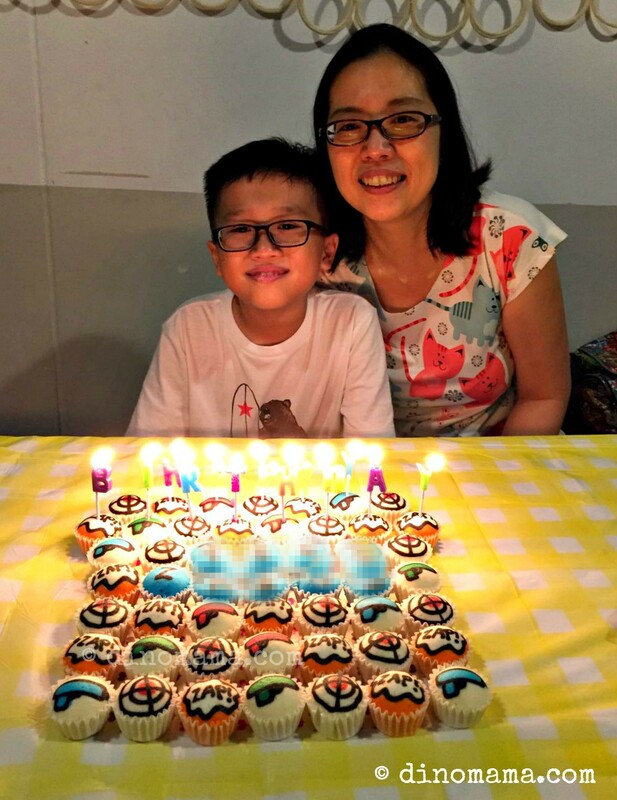 Now, where should I host his 12th Birthday Party next year?